So I am back with a special boshi this time. I have several traditional things on the menu which are mostly seasonal. I don’t usually overload my plate like this as you may have noticed. For me its just a portion each of protein, carbs and veggies however I decided to go ahead and add some extra things on my plate as the dishes were prepared from ingredients that I had brought from Mangalore. I didn’t want all my effort of bringing them to land in the bin and you know that it would be such a crime to waste fresh produce that is not available outside India. I am sure that most of you living outside India consider these things to be more precious than gold and silver 🙂 At least I do! 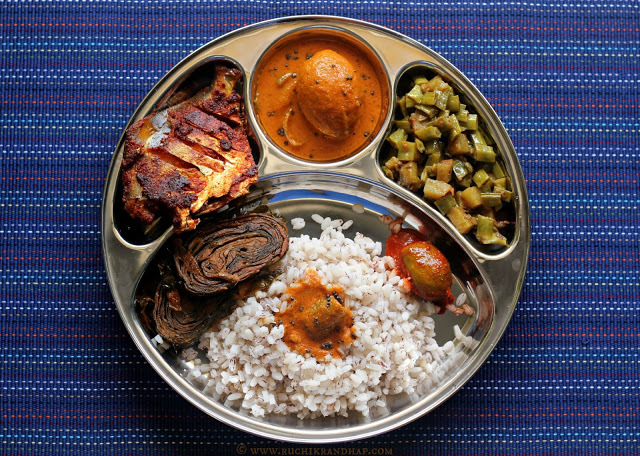 The rice that you see on the plate above is the typical Mangalorean red (unpolished) boiled rice which has this nutty flavour and tastes wonderful even when eaten plain. There is nothing that can beat the taste of freshly prepared rice served with some hot curry on the side – whether it is veg or non veg. I somehow managed to lug back 2 kgs of this rice which I know will get over in no time but yeah, the joy of eating something that was grown in my homeland is something else. I am not sure how many of you will be able to make this boshi as most of the items call for ingredients that are not available easily (or not at all) outside India but I do hope this plate evokes many memories for you. Before I forget, thanks to all those of you who wrote in asking me about the boshi series. From now on (owing to my busy school time routine) I am not sure if I will be able to keep up with this series on a regular basis but I will try and post as many as I can, whenever I can.